Bloom Time and Color: Rose/Mauve flowers in late spring to early fall. 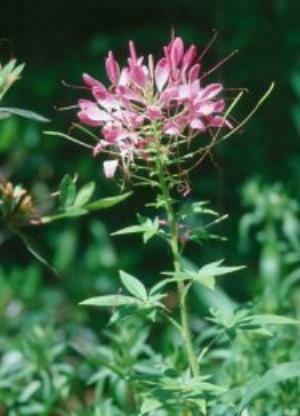 Description: Also known as Spider Flower. Cleome is an annual plant that grows up to 5 feet in height. Use Cleome as a background plant and in borders. Also good in mixed shrub plantings to fill in while shrubs mature. Makes a durable container plant for patio or balcony. The flowers are bright and airy in appearance. Care: Remove spent blossoms to prolong flowering.